Many folks have opposed and criticized locating the library in Dallas Texas on the elite SMU campus with just cause… Not just because of the potential of a partisan institute being linked with an unpopular administration, depending on one’s point of view… Yes even in Texas there are those that don’t want this! Problem solved – A Better Idea! I propose that the estimated $250M be spent on a fleet of 50 bio-diesel equipped Bookmobile’s, one for each state! This way George gets 50 libraries, not just one! George will also get an opportunity make amends and help the less fortunate for once! Wow – A first happened this morning, I received an e-mail from Superman, Michael Moore! He is sending out a message… “The sky is falling…” Please read his message now & call your representative’s now! Click HERE to read Michael’s message! I read a really good article from the Dallas News site that summarizes just what happened to create the financial crisis that “we” all seem to be facing. I won’t bore you with any of my opinions (I usaully do), however, the article is worth the time to read if you care to understand the how and why… When in the article, click on “Key concepts in the banking crisis”, helpful in defining objects in the article. 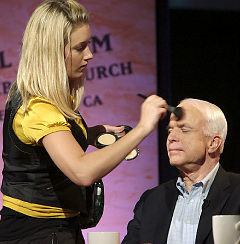 John McCain is so Pretty ! PLEASE – Write your representatives now and tell them, NO Bailout ! This proposed bailout is the BIGGEST sham in my lifetime! COME ON PEOPLE – Ask yourself: Is this right? How many pages are in your home loan documents? I bet more than 3. I thought the home was the collateral when foreclosed upon, the banks still have the assets, yes ? The banks also have the PMI (private mortgage insurance) @ 20%? That should cover the difference! If not, they will sue you the homeowner for any shortfall… So what’s the problem? Last month there was no crisis? When you lost your job, did you get a multi million dollar package? The country has a health care crisis, where is the rush to ensure that no more Americans don’t die every day as a result? If you write hot checks, you go to jail? Would the Fed bail out McDonalds, Wal Mart, Home Depot, etc… if they failed to manage their companies? Frankly – the argument presented by the Fed Chairman is arrogant and bull crap! He said the taxpayer was on the hook either way… So I suggest if I ‘m on the hook either way, then the responsible firms should suffer the consequences along with me. And, if they broke the law stealing from the shareholders, then they should go to prison. Better yet, this falls into economic terrorism, the offender’s should go to Cuba along with the other terrorist. Please take a few minutes and let your voice be heard! It’s your Money! Sept 23rd – Download your FREE Movie! Tuesday September 23rd – Get your free Movie! Slacker Uprising! What’s all the fuss about, take a minute to read Besty Angert’s article (OpEdNews): Slackers Uprising and Slacker’s Uproar Get your free movie, click: HERE for how! Have you registered yet? If not, you are about out of time, PLEASE don’t wait any longer! You can check for drop dead dates by clicking HERE You must register in most states by early October! Please participate, let your voice be heard! Let all of Washington’s politician’s know that they are employed by YOU ! Obama spoke to Women about the economic crisis facing America and made clear the choice between he and his opponent John McCain in Daytona Beach, FL on September 20th, 2008.